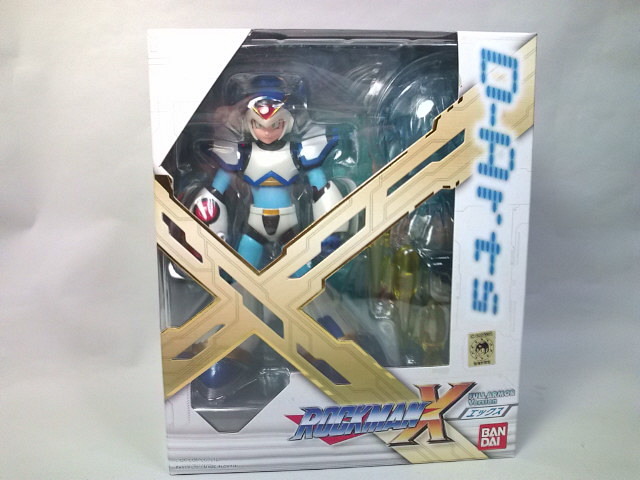 Want to see more of Bandai's newly released D-Arts Full Armor Rockman X figure? 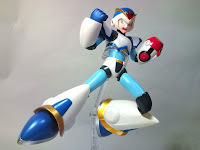 Mecha Guy has a splendid gallery up showing off the figure's quality, poseability, and articulation. From the looks of it, Bandai has once again delivered a fine representation of the famous Maverick Hunter. Nothing short of awesome. Full Armor X is now available in Japan, with imports shipping out some time soon. Bandai plans to localize the figure in states next month, although it remains to be formally announced via press release. That version will be exactly the same as the above, but it's being produced under the "Mega Man" brand with English logos and descriptions. If you're too impatient to wait for the localized version, remember you can import via AmiAmi and HLJ. Aww no Pink/Purple wave charged buster shot? Love the "pure" White Box on this one. My lord they're lazy, they just used the same yellow pellets in the X figure and recolored the charge shot. Yeah, it's not like there's a crazy pink charge shot he uses or anything, that would just be silly. This charge shot is probably too damn heavy like the original too, making it impossible to use without a stand. Damn. Does everyone who gets ahold of the Megaman license have to cut corners? Ok the figure looks good, but after reading a few comments in another article about their flaws, I see what they mean. Like wow, look at the gap between the shoulders. Looks like the owner of the figure got a defective one. I wonder what other flaws it'll have besides the buster and other parts falling off. But that's it???!!! No full charge shot shooting the swirlling pink balls???!!! That's lame!!!!!!!!!! I mean come on, they make a full charge shot for X and Zero, but they can't do the Full Armor's???!!! Lame!!! It's like it's incomplete now. ...People are STILL bitching about seam lines? I've already bought a ton of figures this year, but I will SO be getting this. Yeah, cause when you get the buster armor in X1 the yellow pellets X shoots are totally different. i'm curious, how are his feet able to go that far in any direction without showing the joints? and his legs and arms for that matter. only things i've seen able to move like that are the old gundam toys, and even THEY weren't nearly as flexible, and they REALLY showed thier joints. and @glitchy: i know it's the X1 armor, but the X2 armor DOES have a pink and blue charge shot. I know they're the same, that's not my point. My point is that those shots came with the original X figure, why do we need a second set that looks exactly the same? If they weren't going to include either the Light or Zero Buster charge shot, or preferably both, what was the point of making this its own figure and not just an extra set of parts for X? The could have made a sort of add on set, maybe even include that Dr Light Capsule they keep showcasing at events. I'm still waiting on that, Bandai. Complain all you want, its a damn figure of the X1 armor that was long overdue. Now if we can get the X2 armor, I will be a super happy Vile. "...People are STILL bitching about seam lines?" Companies are STILL putting out models with seam lines? I wonder what the chances are of getting Zero's 'square shoulder' design in a figure. I came into the series late and much prefer it over the rounded one that they made. Getting rid of seam lines means paying Chinese sweat shop workers 1.5 grains of rice per day extra to buff out the parts. That's too expensive. Lasy as hell. They didnt include the pink shot, instead keeping the charge shot with the pellets so they can charge a higher price than if they didnt include them. Ok, you come up with a better way of making the toy then. This is the easiest way to make the parts, and while they are really noticable on the prototypes and the images on the boxes, on the actual figures the seams are so tight you dont notice them. And dont forget you can move the shoulders. I think you forgot that. Its like how people complained about Zero's shoulders, when it was the owners who kept putting him in slouching poses. the round shoulder zero is the first version, and had only the buster. the one with the square shoulders and slightly changed body is version 2, and that's the one with the Z saber. he didn't have that before his rebuild/repair in X2. 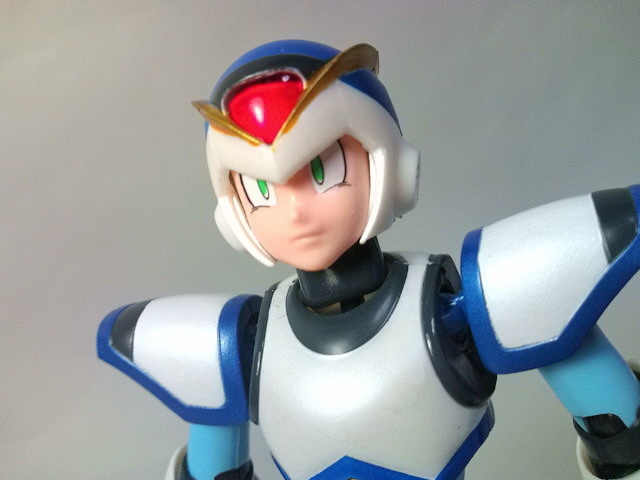 of course, the zero in X6 is identical, but he has a different saber. speculation abounds, but there's no real concrete proof of anything. besides, round shoulder zero was only arround in the first game and MHX. sure, the manga has him, but only for the events of X1. it's a small and overlooked part of the story that's only used to tell version 1 from version 2, and possibly indicate wily's continuing influence. Um, this game franchise has no games and yet it's getting an incredibly accurate figure of his less than iconic armor form. But then again, totally not worth it without the pink charged shot . . .